It is over two months since Malaysia Airlines (MAS) flight MH370 disappeared. With the plane still missing and no convincing explanation as to what may have happened the dreadful saga remains a riddle wrapped in a mystery inside an enigma. Could MAS’ use of social media have made it any less extraordinary? Might social technologies even have helped solve the riddle? Needing to book a flight to Kuala Lumpur I found myself back on the airline’s website today for the first time in many weeks and from the raft of promotions, a banner extolling its five star status, the booking engine, the message the airline wants to push is clearly one of ‘business as usual’. This is understandable given the carrier’s worst quarterly results for years, a 20% slump in its share price and a collapse in passenger numbers since the incident. But it is hardly reassuring when you find yourself having to look hard for a reference to flight MH370, even if your eyes are drawn eventually to a small banner tucked down the left side of the homepage. Najib Razak, Prime Minister of Malaysia, was recently quoted as saying “In the first few days after the plane disappeared, we were so focused on trying to find the aircraft that we did not prioritize our communications.” Given the extraordinary circumstances, the pressure to find the airline was intense. But Razak is correct about the official communications response, which was slow, frequently confusing and which suffered from too many spokespeople, some of which appeared not to have been trained for the media scrum, some with a tendency for passive-aggressiveness. In addition, while they did some things pretty well, the airline and government’s use of the internet and social media could have been much more effective. What went well? And what could have been improved? Access. Malaysia Airlines swiftly switched on an emergency dark site that provided journalists, family members and others with a one-stop resource on the incident, replete with news releases, passenger register and contact details in both English and Chinese. Consistency. All MAS’ social media channels were used to communicate during the crisis, specifically Twitter, Facebook and Google+, with a consistent approach taken across them. Tone. All marketing and promotions were suspended (though recently re-introduced). And the mastheads of all MAS’ digital and social properties were blanked out. Tone. Abbreviated press release headlines cannot and should not replace the human voice that social media demands. While consistency across media can be a good thing, social media should be used principally to convey empathy and re-build trust amongst the broader public, not as a tool for pushing templated news. Content. Many maps, videos and audio recordings were shared during the daily crisis press conferences, yet virtually none of this valuable information was used online by MAS or the Malaysian government. Contrast this with the approach taken (and still being taken) by BP during its Mexico oil spill crisis. Visibility. 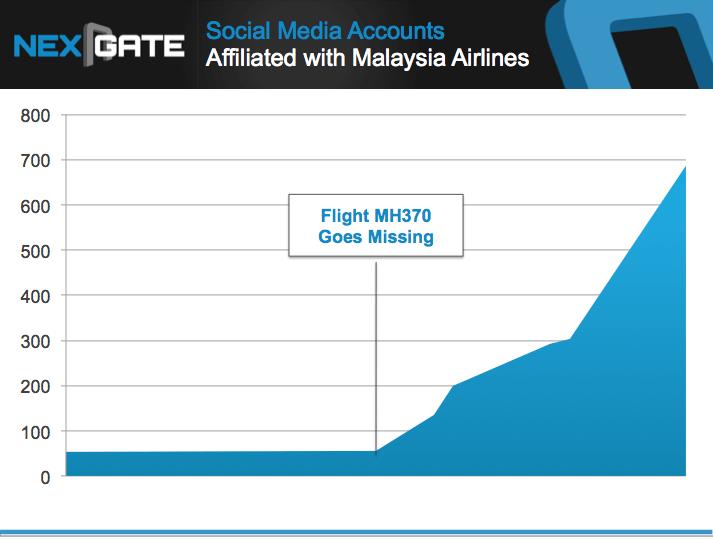 The #MH370 hashtag was quickly adopted by users on Twitter and elsewhere. And while the hashtag was used on the Wall of Hope (pictured above) at the airport and elsewhere, MAS made no effort to ensure its communications were part of the online conversation streams. Control. Given the wildly open-ended nature of the investigation, it is hardly surprising that MH370 narrative was shaped by rumour, innuendo and misleading information. But MAS and the Malaysian government did little to rebut demonstrably misleading information or false rumours circulating online. Nor does have they done anything about the hundreds of fake social media accounts that are being used to spread malware, humble MAS and solicit donations (ie. steal user data). Overall, both MAS and the Malaysian government appeared to be trying to manage the MH370 narrative primarily through traditional media, while using social media to push news in large part as they had existing official accounts and had to use them. But, in reality, MAS and the government had lost control of the story, something that became clearer the longer the plane was missing. Nobody likes to be seen to lose control. But these were truly exceptional circumstances and while high-quality analysis of the data available about the flight was undoubtedly being done by Inmarsat and others, there also appears to have been some strong data collection, analysis and thinking going on between ‘unofficial’ (ie. unaffiliated to MAS or the official investigation team) by transport and technology experts across the world. The Fukushima earthquake and nuclear fall-out demonstrated the benefits of ordinary people, nuclear experts and journalists sharing information and knowledge in the aftermath of a disaster, even if the Japanese government was made to appear out of touch and manipulative. Openly encouraging members of the public to send in photographs and other documentary evidence. Making official data and analysis about the plane’s flight public. Encouraging and even supporting plausible third-party crowdsourcing efforts. By being truly open, Malaysian authorities could have had a better chance of finding the plane, reducing misinformation and, perhaps perversely, regaining control of the narrative. Such a move would certainly have helped re-build trust with the families of the bereaved. Instead, Malaysia Inc. appears out of touch, poorly organised, and secretive. UPDATE: the Malaysian government and Inmarsat have agreed to make MH370 satellite data available.